Meetings of the Management Committee meeting held on 26th February 2018. During the consultation period, comments on our application can be made to the Council. Comments can be submitted online at: https://www.smartsurvey.co.uk/s/RBCNHF/ . Please note that if you do not accept for the Council to hold your details on their database then you will not be allowed to complete the survey. The first Forum newsletter has now been finalised and we expect to distribute this throughout Edenfield over the next two weeks. We are hoping that this will result in many more members joining us. The next meeting of the Forum will be scheduled for sometime in May with the exact date to be advised in due course. At that time we will report on all of the work being done by the Management Committee. Hopefully by then we will also have a decision from the Council on our application for designation. 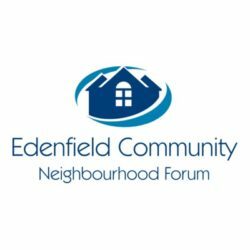 In the meeting held on 5th February 2018, it was agreed that the Edenfield Community Neighbourhood Forum constitution should be updated to reflect the proposed new boundary for the group. Those present voted unanimously to adopt the new area of responsibility and the updated constitution is attached. 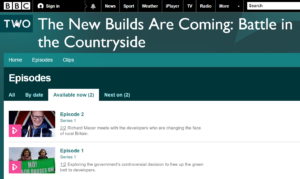 BBC Two series – The New Builds are Coming…. This series was mentioned in our meeting last week. It may be interesting watching for those of us interested in understanding the need for development. Alan Ashworth spotted this in last week’s Times Newspaper. I think that it summarises our position well. We aren’t “NIMBYs” (Not In My Back Yard), but “SLIMBYs” who simply want Something Logical in My Back Yard”. The article is behind a paywall, but describes how developers’ focus on green belt land which is more profitable than brown-field sites. This ignores the fact that local infrastructures may not be suited to developments. When roads, schools, health and public utilities are at capacity, large-scale developments are simply not practical. The next meeting of the Forum will be at 7.45pm on Monday 5th February at the Edenfield Community Centre. A meeting agenda is attached together with a copy of the minutes from the last meeting held on 5th December. This meeting is being held earlier than anticipated due to the Steering Committee proposing some changes to the Constitution which require the approval of Forum members. Para 3.1. 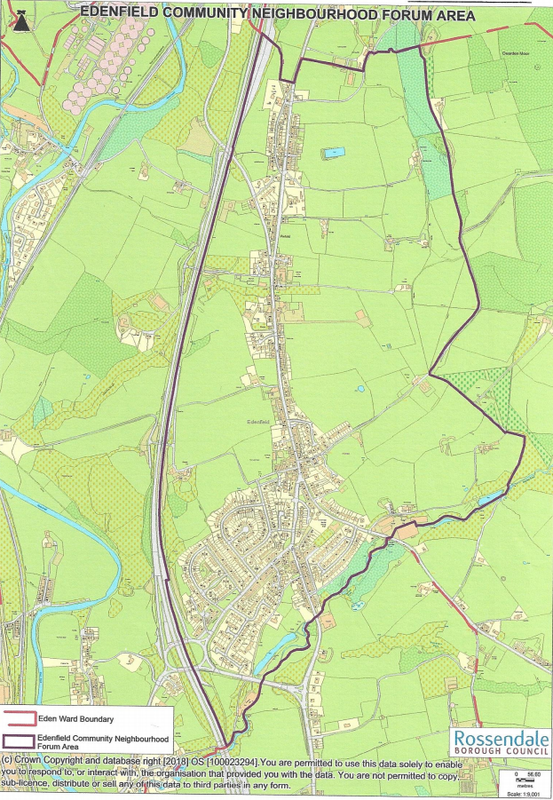 The Area is changed from Eden Ward to Edenfield. 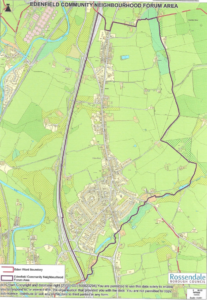 As there is no existing definitive boundary to Edenfield the proposed boundaries are shown in appendix A.
Para 1.1 As a result of the change to the Area the name has been changed to “Edenfield Community Neighbourhood Forum”. This is obviously a very significant change to the Forum which the Steering Committee considered to be necessary for it’s future successful operation. The reasons will be discussed at the meeting. Copies of the proposed revised Constitution and the Appendix A map are attached. Meetings of the meeting held on 12th December 2017. East Lancs Railway in the valley bottom at Lumb below Edenfield. Valley up to the Scout Moor Reservoir The green grassy dam at the head of the valley can be seen. Beyond this is Scout Moor Reservoir. The old tram line’s route can be clearly seen along the right-hand side of the valley. Downstream leads to Dearden Clough and the remains of Plunge Mill. Graveyard at Edenfield Parish Church. Feeding Time A farmer tends to his sheep just below Fecit Farm next to the A680 Rochdale Road. Stubbins Primary School, south of the A56. Waugh’s Well. This monument was originally built on the site of a spring in 1866 to honour Rochdale-born Edwin Waugh (1817-1890), one of Lancashire’s finest poets. It was rebuilt in 1966 in memory of Ward Ogden, a local naturalist and rambler. It makes for a fine contemplative viewpoint and resting place on the Rossendale Way. Bridge Mills, Edenfield, Lancashire. This old cotton mill is now being used as a series of light industrial units, many associated with the motor trade. 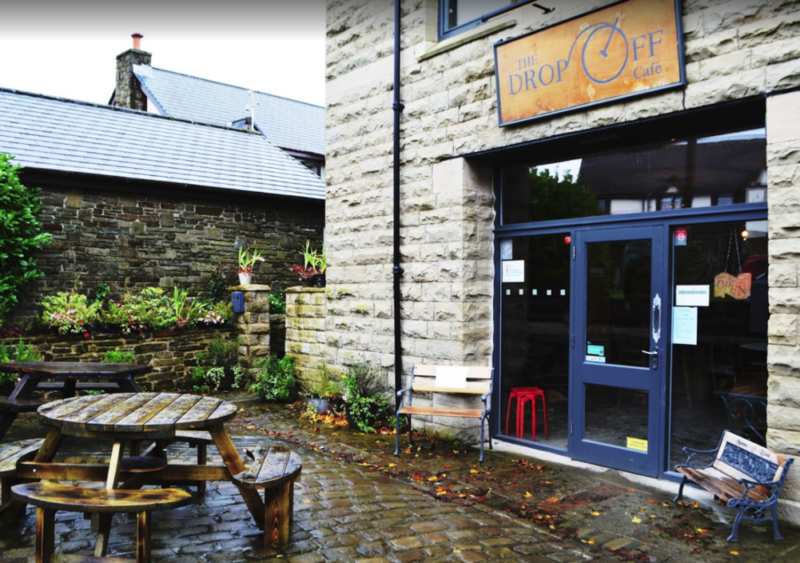 Drop Off Cafe, Edenfield. A popular watering hole for walkers and cyclists. Market Place With Exchange Street to the right. These buildings are occupied by Celeste Arnold hairdressers and Valentine’s butchers. 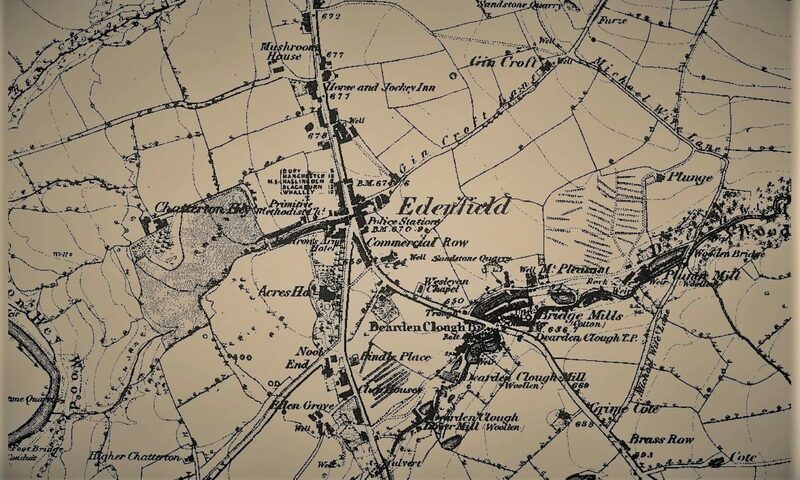 Edenfield has approximately 900 homes varying from old farm and mill worker cottages, terraced housing as well as more modern housing developments. The majority of houses are close to the major thoroughfares of Bury Road, Rochdale Road and Market Street. The former Conservative Club Market Street, Edenfield. Now converted to flats. Heycrofts View off Market Street, Edenfield. These properties were built on land next to the former Co-op buildings at Elizabeth Street. This row of stone cottages are located next to Rochdale Road in Edenfield and are situated below street level.